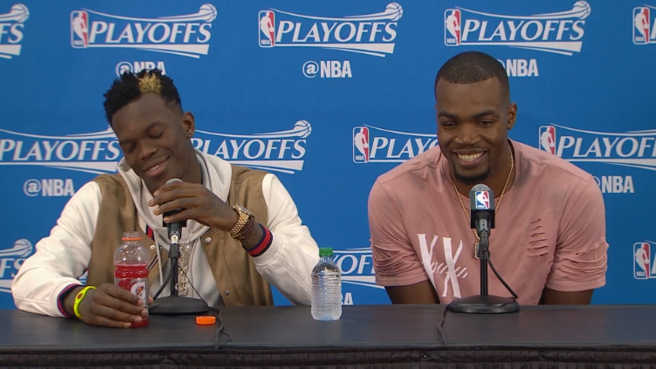 See Dennis Schroder's Hilarious Reaction to Markieff Morris Calling Paul Millsap a "Crybaby"
The beef between Atlanta Hawks' Paul Millsap and Washington Wizards' Markieff Morris just got more intense. The two have been jawing at each other in their first-round playoff matchup, but it took another turn after the Wizards' Game 3 loss. Markieff Morris on Millsap: "He just did more for his team. He's a crybaby. Get all the calls & you a crybaby." Millsap, after being told about the “crybaby” talk, was asked if his matchup with Morris is becoming personal in his postgame press conference.